Freeing terrorists with blood on their hands will ultimately be in Israel’s favor, Minister of the Interior Gidon Saar argued Sunday, as the government prepared to vote on a plan to free over 100 prisoners as a "gesture" to the Palestinian Authority. “It’s easy and populist to vote ‘no’ – but what would happen if all of us, or even half of us, voted ‘no’?” he asked. 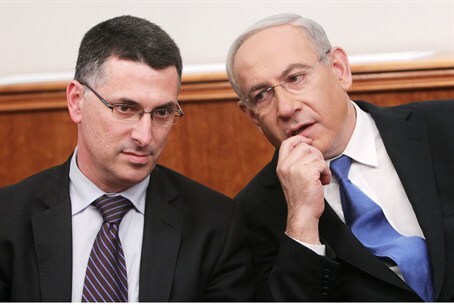 Israel must be cautious, Saar warned. “Our position in the international system is not a simple one, to put it mildly. We are likely to deteriorate quickly, in a manner that would have a severe impact on our national interests,” he argued. “To clarify, these national interests include our ability to insist on defensible borders,” he added. The Palestinian Authority wanted three main things from Israel in advance of talks, Saar said: the release of terrorist prisoners, a full ban on construction in Israeli towns east of the 1949 armistice line, and an agreement that territorial negotiations would be based on the 1949 armistice line. Netanyahu made a strategic choice, he said. “If you look at the main reason we have been dealing with diplomatic difficulties since the former government was established in 2009, it is our unwillingness – which has not changed – to accept the ’67 lines as a basis for talks… The Prime Minister was tested in this matter, it was not easy – including opposite the President of the United States… This is a central strategic issue,” he explained. “Today, the members of government face two bad choices: to vote for, or vote against. I believe that a vote against is a decision that would do far more damage than a vote for,” he concluded. Despite Saar's insistence, not all members of the government are convinced that the release is a good thing, to put it mildly. Bayit Yehudi (Jewish Home) MK and Knesset faction chairwoman Ayelet Shaked slammed the move as a "surrender to the Americans" on Sunday. Speaking at a rally opposing the release of terrorists, Shaked accused the government of forgetting "why we are here and how to stay here. It started with giving in to terror in the Shalit deal and continues with surrendering to the Americans. For what?” She added that although Israeli agent Jonathan Pollard killed no one, and shed no blood, he is still sitting in a prison, decades later, despite appeals even from the prime minister himself. Bayit Yehudi leader and Minister of Economy Naftali Bennett has said that he strongly opposes the move and will vote against it when it is brought up for a vote at the cabinet.